Real life and imagined examples of systems thinking. What can we learn from Finnish anarchists? The clashes between anarchists and the police during the Finnish independence day have recently been a hot topic of discussion in Finland. A group of anarchists had started a riot on the evening of independence day, which resulted in destroyed public and private property. Destroying small companies’ property has especially been the subject of public outrage. But is there something we can learn from the anarchists? It is very difficult to understand what the anarchists tried to achieve by breaking other people’s property. One way to look at it is that by breaking stuff the anarchists try to draw attention to issues in our society. What the anarchists probably don’t understand is that the violent actions themselves easily become the center of attention instead of the anarchists’ actual message. However, shunning the anarchists helps no one either. Pointing fingers and demonizing the rioters only feeds our own egos and makes us feel superior. The reason we make the anarchists the bad guys is because it’s the usual knee-jerk reaction to violence and because it provides a simple cause-effect explanation removing us from any responsibility. But is there an alternative? If the anarchists aren’t at fault, who is? The reality is that finding fault is irrelevant to begin with. Trying to find someone to blame begins with the false premise that there is in fact someone or something that can be identified as the single cause for our problems. Thus, the alternative to blaming the perpetrators is looking at the issue from a totally different perspective. Let me begin by quickly defining the opposite of systems thinking, which I will in this case call linear thinking. Using linear thinking we would conclude that because the anarchists were the ones wrecking places, the problem is in the anarchists. It provides a simple analysis: anarchists break places -> anarchists are the problem. Cause and effect. Systems thinking would instead begin by trying to view the phenomenon as part of the whole society. According to systems thinking, in order to understand a single event it has to be observed in the context of the larger whole it is part of. In this case, the anarchists’ actions would be explained in the context of the underlying social problems that influence the anarchists’ behavior. By understanding systems thinking we would realize that the anarchists’ actions do not represent the failing of an individual, but are the end result of some systemic structures in our society. The real issues leading to the events on independence day might have been developing for years, if not decades. Thus, issuing blame on individuals is useless, if not dangerous because it prevents us from understanding the real causes. I am not saying that individuals shouldn’t be held accountable for their actions. Free will still exists and individuals need to take responsibility for their behavior. What I am saying is that we need to start talking about the real issues rather than pointing fingers. In the previous two examples I have introduced two basic systems thinking principles. The automobile example from Russell Ackoff demonstrated that a system is not the sum of its part but the product of their interactions. The second example was from Donella Meadows, and the lesson was that the behavior of the system can only be changed by changing the system itself. In this blog post I will briefly touch upon how to think about any situation using systems thinking with an example from Peter Senge’s book The Fifth Discipline. The above picture illustrates how the different elements of the system influence one another. You can begin reading the picture from anywhere. An arrow indicates the direction of influence. 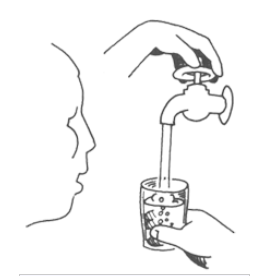 Desired water level influences the perceived gap, which influences the faucet position, which again has an influence on the water flow. 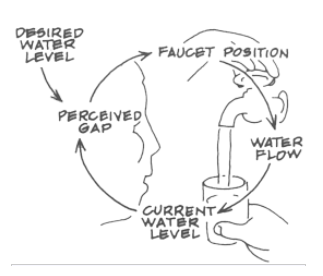 When the water flow changes, it in turn has an effect on the current water level, which finally influences the perceived gap. This is how systems thinkers view situations, problems and the world in general. Instead of one time events and simple cause-effect relationships, they see circles of causality. This thinking can be applied to practically every major problem out there. Think about terrorism for instance: most of the time we only pay attention to the one time incidents and terrorist attacks we see in the news. What we don’t know is what has been influencing the terrorists in a way that causes them to take violent action. With only superficial knowledge about the reasons behind terrorism, we then respond in fear and anger, which often only increases the terrorists’ conviction. Not all situations work this way though. If you were to kick a ball, the ball would simply bounce away. Here a simple cause-effect analysis would be sufficient and the event could be explained with physics. However, if you were to kick a dog, the poor creature would react in some way. It might run away, but it could also attack you. You are influencing the dog’s behavior by kicking it and in return the dog will influence your behavior by attacking you. If I were to walk in a room where I only see the dog attacking you, I might easily jump into conclusions about the dog too quickly. This is how we humans perceive the world most of the time, which is why our problem definitions are often so badly off the mark. The Principle: Instead of seeing one time events, look for circles of causality. Next time when someone is angry at you, try to look for ways you might have influenced his or her behavior. In the news you see only one time events and the end results of some larger phenomenon. Instead of talking about the event itself, try to think about what kind of circles of causality might have caused the event. In an arms race between nations there is no one country or individual to blame. It is the result of all the countries influencing one another. In her book Thinking in Systems, Donella Meadows tells how she would often bring a slinky to her classes in order to teach her students systems thinking. 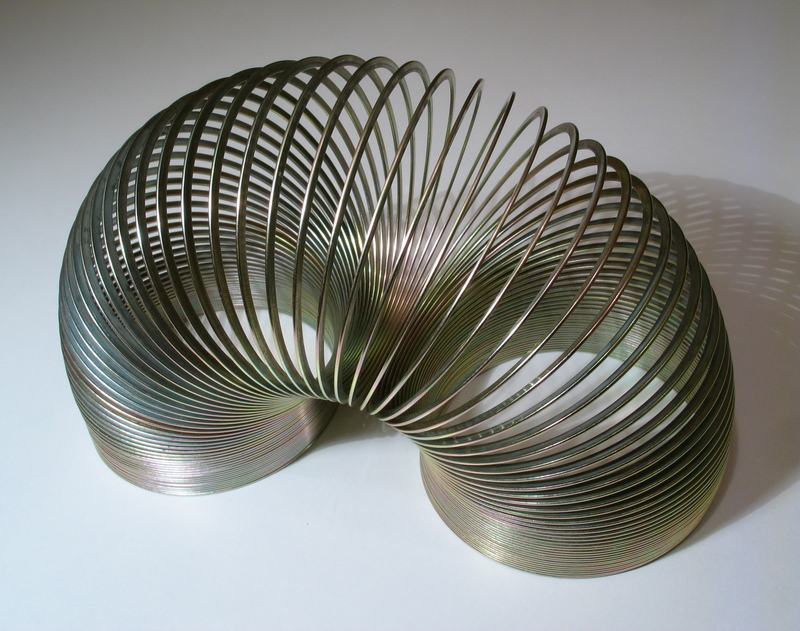 What exactly can we learn about systems thinking from a slinky? Suppose you’re holding a slinky in one upturned hand with the other hand under the slinky. Holding the slinky with one hand you pull the other hand away and let slinky loose. As you’d imagine, the lower end of slinky will bounce up and down in air, with the upper end suspended in your fingers. The question is: what made slinky bounce up and down? The first answer that might cross your mind is that your hand was the cause. By removing your hand below slinky you let it loose which made it bounce. However, it’s clear that you would not get the same reaction by holding a book, a hammer, or anything else other than slinky in your hand. Slinky bounces up and down because of some inherent characteristic within slinky itself. If that’s the case, what does this actually teach us about systems thinking? In slinky’s case its easy to understand that slinky is a physical system whose behavior is fundamentally dependant upon two things: 1. the characteristics of the system, 2. outside forces affecting the system. If you manipulate slinky in different ways you would get different behaviors, but the behaviors would always be closely related to slinky’s internal qualities. But why is this important? Well, just think about how governments, politicians, organizations and institutions usually approach problem solving. Drug problems are solved by putting addicts into prison, type two diabetes is taken care of by prescribing medicine, and poor economic growth is resolved by subsidizing badly performing industries. Different countries have their own bad examples, but the thinking behind the issues is often the same. We as humans tend to often focus only on changing the way we manipulate a system, instead of changing the system itself! With simple physical systems we know how to make system change possible: you would not use slinky to hammer a nail, you’d use a hammer. However, with more complex systems, such as schools systems or cities, we sometimes forget that the behavior we witness is the result of the system acting the way it’s design to act. If the end result of a system is drug addicts and population suffering from diabetes, then the system has been designed to produce these results. Instead governments and organizations often find blame in some outside forces. They try to fix the issue by starting initiatives and programs rather than changing the system itself. In the US the government appears to often declare war against societal issues, effectively preventing any real change from happening. In Finland, our government attempts to get students to graduate faster by placing restrictions on maximum study years, which is another demonstration of linear thinking. The principle: The system itself often causes its own behavior. In order to change the behavior, change the system. Type two diabetes and heart problems are not the failing of an individual. We have encouraged the development of industries that produce foods that are cheap and unhealthy. We have also made easy access to these foods possible. Long times of graduation in Finland are not because students are lazy. Our education system encourages students to postpone graduation. In my previous post I discussed about what systems thinking is. However, systems thinking can best be understood by viewing real life phenomena and everyday issues through the systems lens. In the coming posts I will try to demonstrate systems thinking through examples I’ve learned along my studies. Suppose you’re building the best automobile in the world. You would go about it by first bringing each of all the car models in the world to one place. You would then hire the best automobile engineers and mechanics in the world and ask them to determine which of the cars has the best engine. If the engineers say that the Rolls-Royce has the best engine, you would pick the Rolls-Royce engine for your car. Similarly, you would ask your engineers to find out which of the cars has the best exhaust system and pick that for your future car. Using this method, you and your team would go through the necessary parts for building an automobile and in the end have a list of the best parts available in the world. You would then give the list to your engineers and mechanics and ask them to assemble the car. What do you think you will get? The answer is obvious: you don’t even get an automobile! The parts won’t simply fit together. An engine from a Rolls-Royce won’t work well with an exhaust system from a Mercedes. The performance of the automobile is dependant on the interaction of its parts, not on the performance of the parts taken separately. It’s extremely important to understand that the idea works the same whether we’re talking about building an automobile, governing a nation or running a company. This is relatively easy to understand with physical systems such as an automobile, but with more complex systems like cities it often gets more difficult. The principle: A system is not the sum of its parts, it’s the product of their interactions. The original example is at 5:57 in the below video. Enjoy!